Here's another mini album that I made to document Gracie's second Halloween. and then made a bunch of simple page layouts to showcase the photos, because they're so Stinkin' cute! Then, I created a 4x6 photo block on each page, bordered on both sides by patterned paper, one thicker than the other. The photo blocks either contained 1 - 4x6 photo, 2 - 3x4 photos, or in the case of the title pages, the title. I either kept the photo blocks running horizontal or vertical to suit the photos and just rotated my sketch to suit. This kept the pages looking fairly uniform. I used a bunch of leaf die-cuts (some of you may recognize these from our wedding invitations), some twine, stamped some black ink on kraft paper and added some glitter. The elements were clustered differently on each page to add interest. 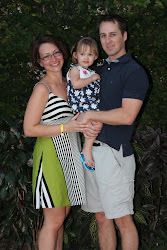 And, that's how you make a quick, cute album to showcase some of your favourite photos! 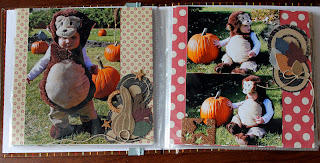 I used a Lilybee Designs 6x6 paper pad form this album. What a cute album! Those 6x6 papers worked really well and those photos are too cute.